Setting up a schedule that works for YOU. When was the last time you looked at your schedule for the week, and said, "YES! I've got the perfect number of clients, on just the days I want to see them, and I have plenty of time to work on the business side of my practice, too -- my work/life balance is just perfect!" Not quite like that, huh? Maybe it’s more like you take clients whenever THEY can work it into their schedules, or you work so much that you can't remember the last time you had a calm, leisurely dinner with your family. Which really means – you’re doing everything for everyone else, and you're on your way to burnout. 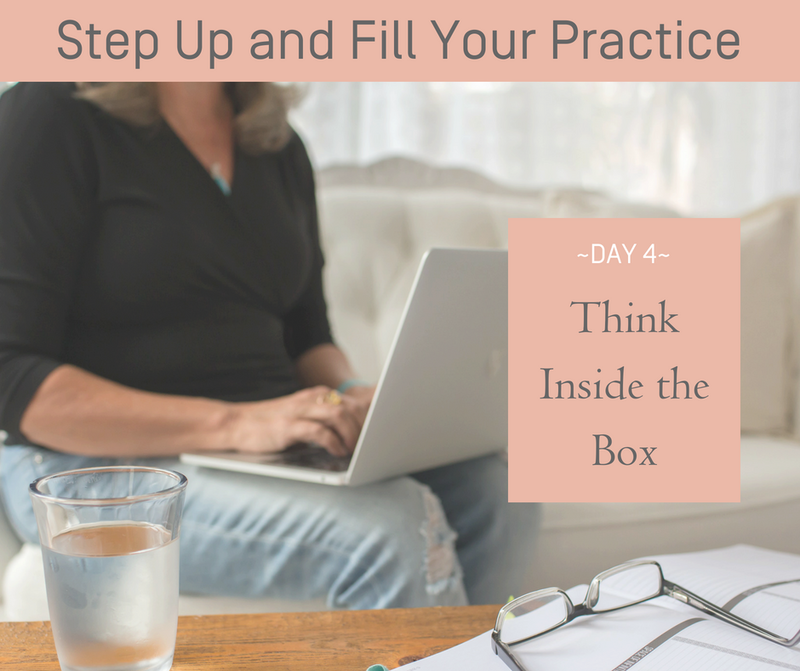 And you still can't find the time to work on the business side of your practice. Time to think INSIDE the box! If you’re ready to set up your schedule so that you can finally start striking the balance between helping others and helping yourself – you’re going to love today’s challenge to set yourself up for success each day!